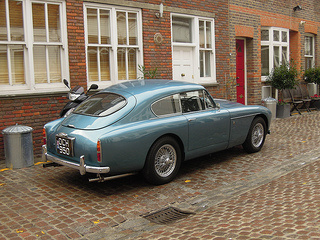 The Aston Martin DB2/4 Mark 3 sports car was introduced in 1957 as a 2+2 hatchback, and was the successor to the DB2/4 Mark 2, of which 199 cars covering three variants were built. In 1959, in order to complement the hatchback variant, a two seater Drophead Coupe and Fixed Head Coupe were introduced towards the end of production of the Mark 3 that year. 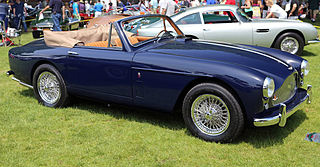 A variety of engines were used with the Drophead Coupe, and both variants were fitted with the more traditional hinged roof lids in preference to the hatchback body styling of the 2+2. 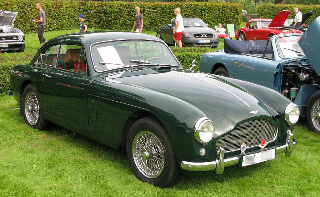 The Mark 3 sports car continued with the coachbulder Tickford, and was the final evolution of the DB2 by way of the Mark 3A in 1958, and ending with the Mark 3B in 1959. When production ended in 1959, 55 units were produced, and comprised: 462 Hatchback, 5 Fixed Head Coupe (with DBD engine only), and 84 Drophead Coupe (68 with DBA, 2 with DBB, and 14 with DBD engines). 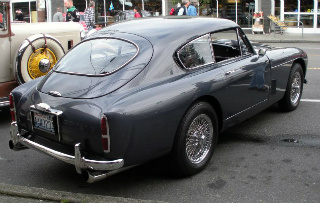 Interestingly, a DB2/4 Mark 3 was used in the James Bond film "Goldfinger". An eminent motoring magazine described the Mark 3 as "A car for the connoisseur". This was the standard version, and consisted of the 2.9 litre, straight six, Lagonda unit, as used in the Mark 2, fitted with two SU carburettors, and developed 165 bhp, with a top speed of 120 mph, and 0-60 mph in 9.3 secs. However, when fitted with an optional dual exhaust system, output would increase to 178 bhp, producing the same 120 mph top speed but with 0-60 mph now down to 9.2 secs. This optional unit with increase performance was fitted with three Weber twin choke carburettors, specially designed extended duration camshafts, increasing compression to 8.6:1, high compression pistons, together with the dual exhaust system. This format now developed 195 bhp, but was only fitted to 10 cars. This less extreme optional unit was fitted to 47 cars, and consisted of three SU carburettors and the dual exhaust system, which developed 180 bhp. This was the ultimate option fitted to only one car, and consisted of three Weber twin choke carburettors, compression raised to 9.5:1, racing camshafts, specialised con rods, and high compression pistons. This arrangement developed 214 bhp. 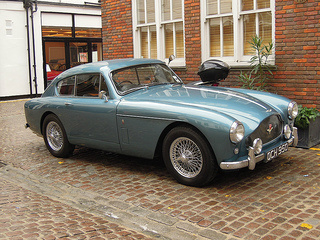 A fine example of an Aston Martin DB2/4 Mark 3 sports car would fetch in the region of $200,000/£125,000 to $250,000/£160,000, whilst a really superb car would command between $300,000/£190,000 and $400,000/£250,000.